It's always nice to change the look of the website you run or set up the new highly modern one. Welcome the fresh goodie that is complimented with a Scandinavian design, that is popular today for its simplicity and beauty. 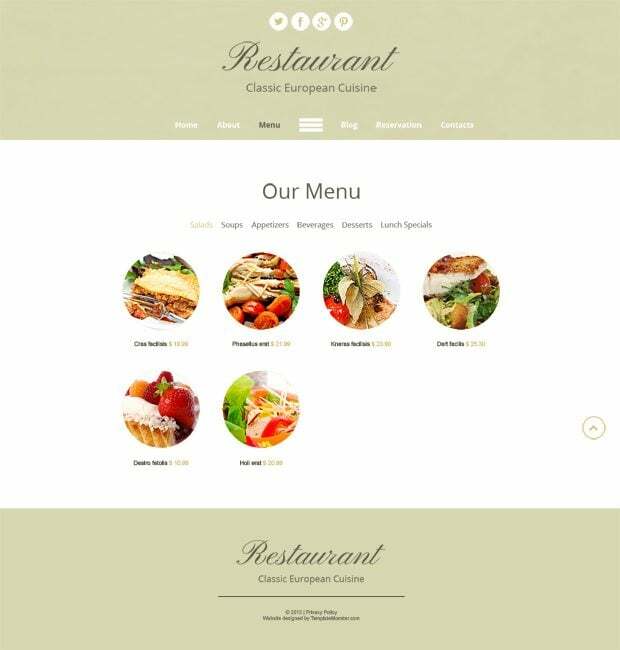 Function and aesthetics are the key points of this Free HTML5 Theme for Restaurant Site that will certainly raise the interest of your potential clients. I hope, you’ll like a well-balanced look and good functionality of this theme. 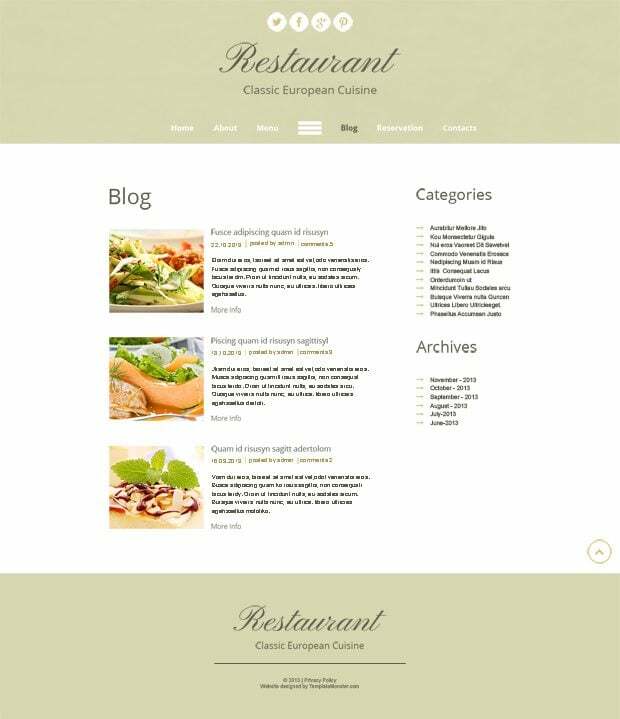 As you see, this fully-charged theme is a solid basis for your websites that deal with food & restaurant sphere of business. Whatever site of this kind you’re going to set up, here is a good starting point. Here are the main points you’ll certainly like about this theme. All elements implemented in this design behave harmoniously, and give an attractive look as a result. A touch of Scandinavian style that is known for its cleanliness & beauty. It’s all about creating awe for the viewers without compromising on the functionality of the theme. The main goal is to let business ideas lead and to be in the focus of attention, while the design underlines them. The muted and so pleasant on the eye color scheme of this theme produces such an effect. Circular design elements. Have you noticed the implementation of rounded shapes in this theme? This design trend doesn’t lose its position and viewers’ interest this year, so you can be sure that the theme you get is really modern. 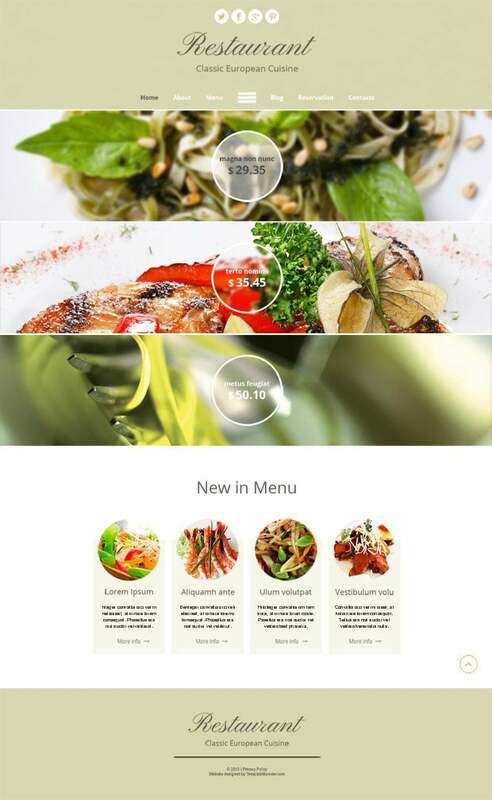 Animated Border Menu in the header works as a burger menu. In zero position you can see only three dashes in the middle of the page. Menu items are revealed when you click these dashes. 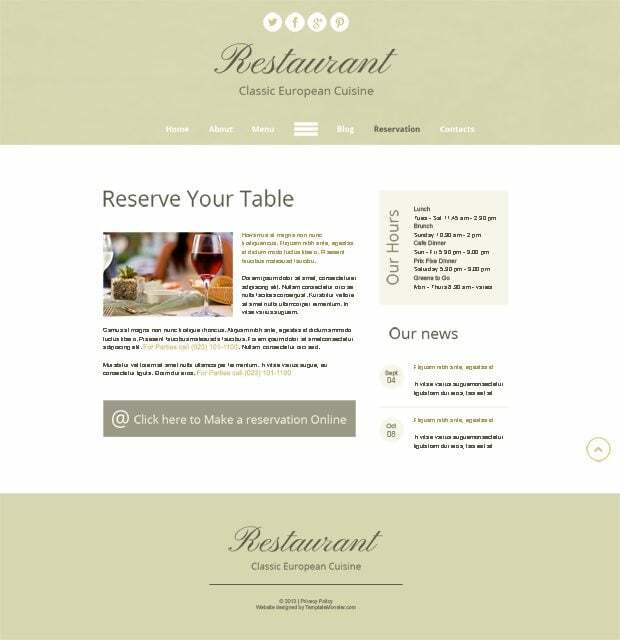 If you want to see the script that was used to create this menu, follow the link. You can also find several variants of this menu there. Snazzy Map. Our designer decided to play with a map on Contacts page and used one of those nicely done items presented on Snazzy Map site, where web designers and developers can choose among variety of different color schemes for Google Maps. We've used Pale Down map, a perfect choice for sites with muted color scheme. That’s all I wanted to tell you about this theme. Now it’s your turn to see it and enjoy. 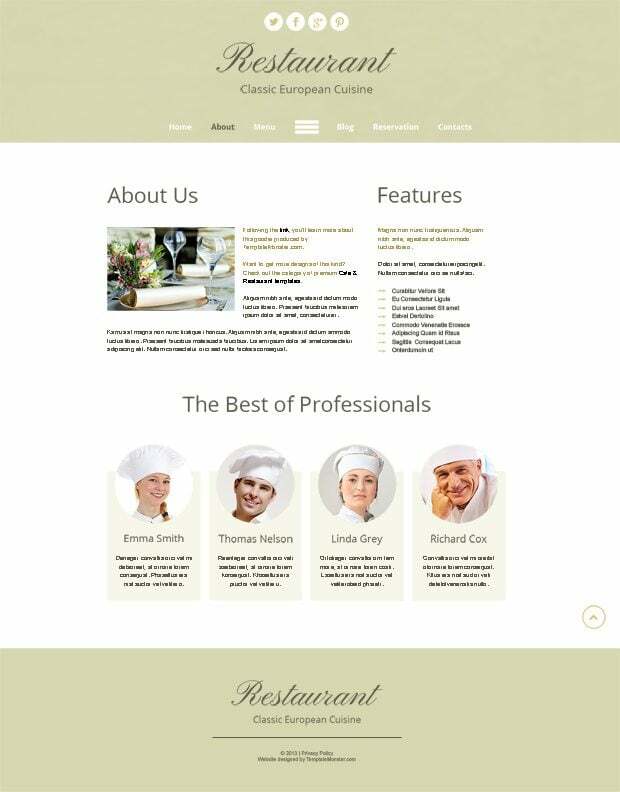 Chick and modern look of this Home page and overall theme is achieved due to Scandinavian style (olive-colored background, nice typography, blurred images and clean look). Clicking each of three full-width images, you go to the Menu page. About page pleases the eyes with the same clean look and circular design elements in Best of Professionals section. 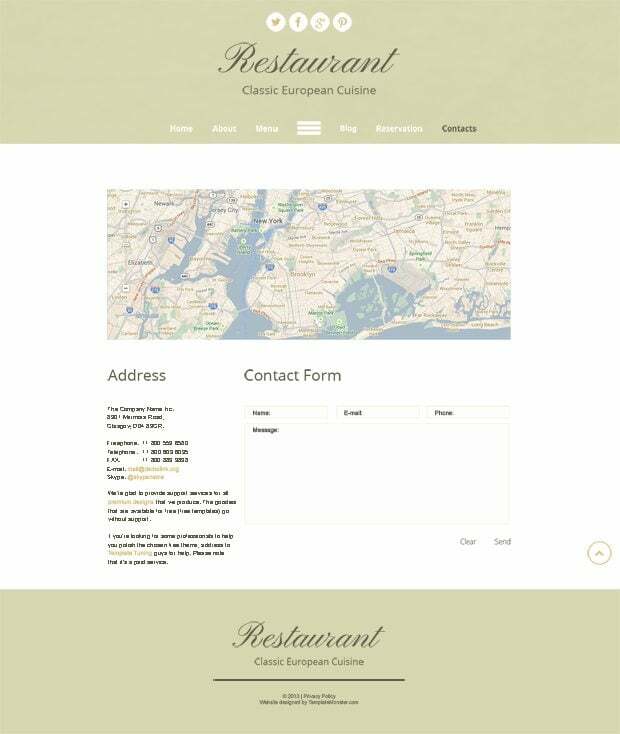 Click the circles on the Menu page to see all dishes the restaurant offers. Blog page with wise structure allows easy browsing of the newest posts and archive (in the right sidebar). Thought-out arrangement of content sections on the Reservation page will provide your visitors with easy-to-reach information about reservations. Contacts page makes use of the map picked up from Snazzy maps site. Notice how nice its pale color works for this design.